Lalaloopsy: Friends are Sew Special! (ALL-NEW – AVAILABLE FEBRUARY 4, 2014): Nickelodeon’s newest adventure may be the most loving yet! These magical “Lala’s” are all very different but have one thing in common- the love they have for each other! SpongeBob SquarePants: To Love A Patty Experience the love between SpongeBob and the most perfect Patty he’s ever cooked as he tries to say good-bye to it in “To Love a Patty.” Enjoy this and six other fun and heart-warming episodes on this special SpongeBob SquarePants DVD. Nickelodeon Favorites: We Love Our Friends Feel the love of friendship with Dora the Explorer; Go, Diego, Go! ; The Wonder Pets! ; Blue’s Clues; Yo Gabba Gabba! and Ni Hao, Kai-lan. Nickelodeon Favorites: Celebrate Family! Nothing beats the love of family so share it with Dora the Explorer; Go, Diego, Go! ; The Wonder Pets! ; Blue’s Clues; Yo Gabba Gabba! and Ni Hao, Kai-lan. Dora the Explorer: Dora Loves Boots: The bond of friendship is strong between best friends Dora and Boots. Celebrate this loving season with three exciting Dora the Explorer adventures. 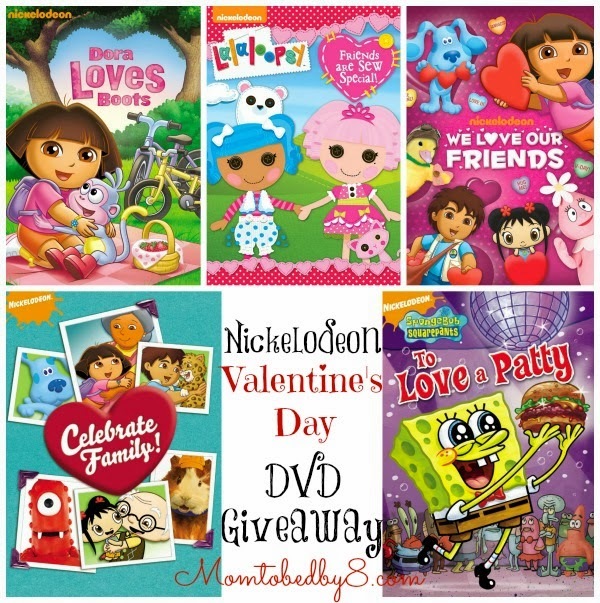 One lucky reader will receive all 5 Nickelodeon DVD's above. Event organized by Mom to Bed by 8. Giveaway ends February 14th at 11:59pm, open to US and Canadian residents only, ages 18+. To enter please use the Rafflecopter form below. Good luck. Disclaimer: Clair's Freebies was not compensated for this post and is not associated with any of the companies named above. No purchase is necessary to enter. One entrant per household. Void where prohibited by law. The odds of winning are based on the number of entries received. Confirmed Winner(s) (by Random.org) will be contacted by email. Winner(s) have 48 hours to respond before a new winner is chosen. The sponsor(s) will be responsible for product shipment to winner(s) of this sweepstakes. My blog is not responsible for product shipment/delivery. This event is in no way administered, sponsored, or endorsed by, or associated with, Facebook and/or Twitter, Google, Pinterest. This disclosure is done in accordance with the Federal Trade Commission 10 CFR, Part 255 Guides Concerning the Use of Endorsements and Testimonials in Advertising. Contact teri@momtobedby8.com if you have any additional questions or comments. Lalaloopsy my lala loves that show.